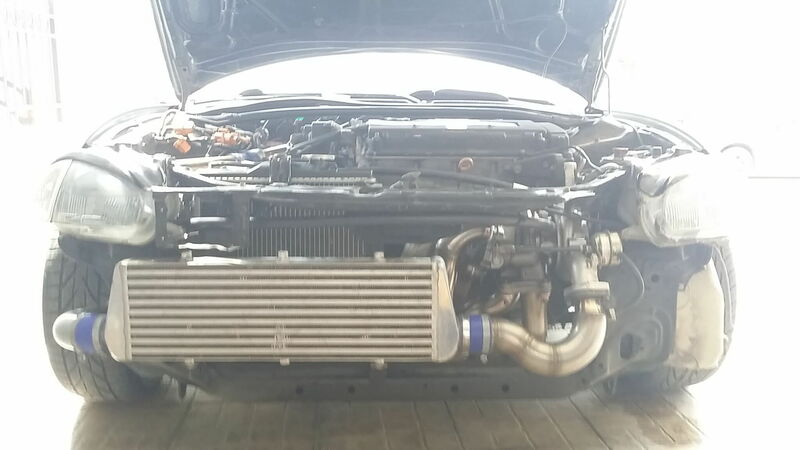 Hallo guys after quite some time i finished my del slow turboing the stock B16 engine. to a divided turbo. EVO X turbo looked good for this idea and i was thinking well this turbo might even spool early like 3500-4000 rpm(...) since its a divided turbo setup. My target was "lets keep it around 230 to the crank for start.Maybe 250 to the tire later. if everything goes allright"
The oem MHI actuator was super tought and i wouldnt be able to drop boost below 15 psi.So i got a 0.4 bar (6psi) garrett actuator. All cool and straight to the tuning on the street with crome gold with a tuner friend of mine. such a low end spooler turbo and low rpm torque? Remember engine is stock. While cruising/daily driving is a dream, half throttle boosting at 2,5k rpm is a TOTALY different experience. So i will need to raise boost to ~ 10 psi. I know boost is not the problem but it will push the low end torque even more. 2) Maybe i should get GSR/ITR cams to get just more mid / hight power without raising too much boost to protect the low end. 3)Maybe it doest matter at all?Just crank the boost till it hits 250 to the tire? Very interesting setup. That turbo is stupid responsive on my evo x at 24psi ;) lol. You will be just fine at that power level with a stock block. Tune it and enjoy. Way back when... people used to use the Hf manifolds for d-series builds with adapters to mount the turbo right onto the cast manifold. A lot of the the GM guys still us the truck log manifolds to implement the same concept. that's an awesome solution! I have the same turbo on my stock b16, making 290hp at 10 psi, and you can see the power band from the graph in my thread . Since you don't have detonation you are good to go! Haha you have the evo X turbo too right? With stock cams 290hp?Somehow my car feels like 200hp at 5-6 psi. Very cool, and similar to what I'm hoping to get with my build. The instantaneous spool/boost like what you were describing for daily driving must be amazing. Imo GTX2860R will spool slower from an evo turbo on a 1-4 2-3 divided manifold. 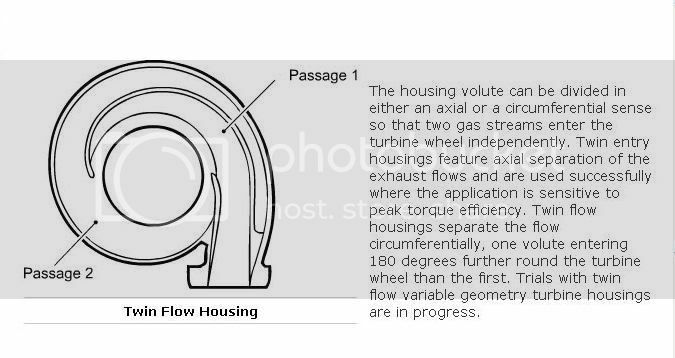 TheShodan might unswer this but is it a true twin scroll if the gases are divided all the way to the turbine blades?Cause thats what exoX turbine housing is.Divided from the intake, divided wastegate exit and divided all the way to the tip of the turbine blades.Also casting looks SUPER quality. In essence yes. A true twin scroll is going to be divided entirely throughout the turbine housing volute. This is best for smaller sized turbos, and not large ones over GT35R size. So, don't get fooled with a divided turbine housing vs. a twin-scroll divided turbine housing. 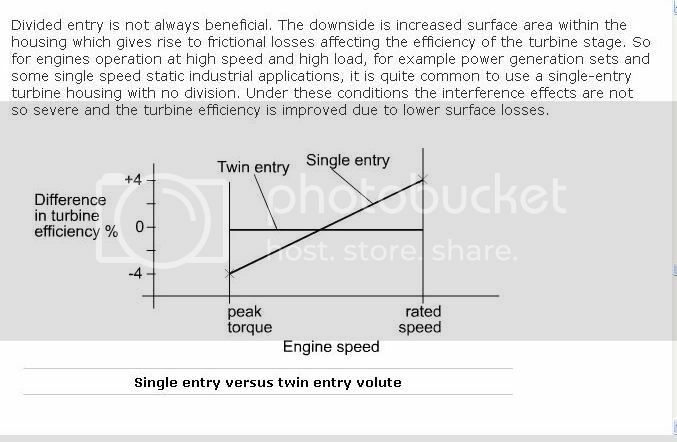 Here's a small little blurb illustrating how a true twin scroll changes the behaviour of smaller turbochargers. 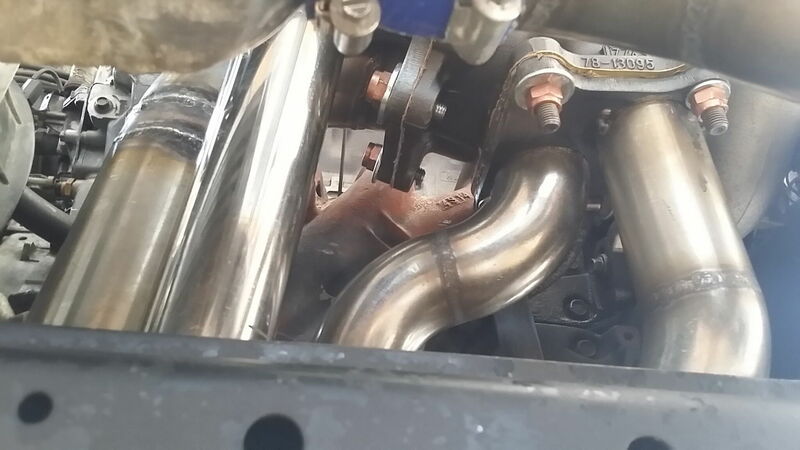 I've found that in most cases, when twin-scroll technology is utilized, it is for the creation of an environment of more efficient exhaust energy streamlining in an effort to create more torque for a given application, and not for more overall top end power. That's why they should be limited in their size use for small to mid-framed turbochargers and the relative size of the exhaust wheel has to be taken into account. 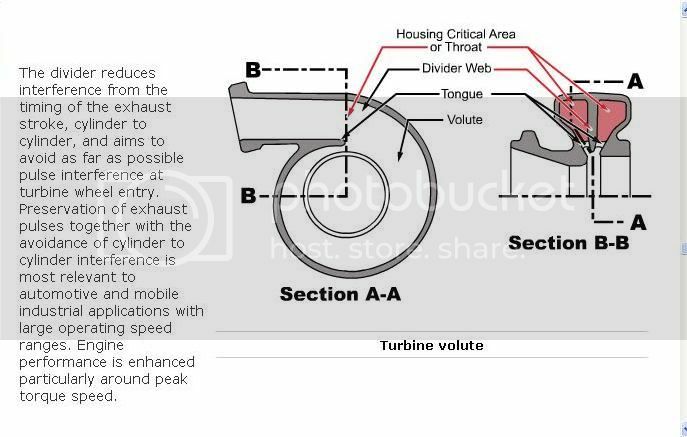 Sadly I go through this argument with the Evolution guys in the U.S. that still confuse the terminology (Thanks, Full-Race circa 2004 :( ) and try to use divided housings with large turbine wheels, call them "twin-scrolls", get more peak power (due to the larger volute size, obviously), but no change in torque. In just about every case where I have to use a turbine wheel that is about 68mm or less and a person wants to use divided housing in a larger A/R thinking it is a "twin-scroll", I always recommend to go down a notch to an open volute turbine housing in a smaller size using that same turbine wheel. You'll see much better torque response, and overall powerband when doing it that way. So, if you're ever in a situation in which you have a choice in turbine wheel size or changing the A/R of the turbine housing... stick to the turbine wheel change first, then go to a different turbine housing volute size if needed. Don't discount the GTX2860R, as it is an extremely fast responder for its size, whether using a twin scroll turbine housing or not. But with anything larger, there is the risk of a bit of responsiveness. The key is to find a balance in size, and behaviour. This can be huge discussion.But at least i can speak the same language with someone. I agree with you i believe.I was allways saying that the high speed exhaust gasses(low a/r) with bigger lever (bigger exhaust wheel radius) works the best. I was about to get a custom turbo with 8cm hx40 turbine wheel some years ago when i wanted 450++ whp on premium pump gas.But the project was canceled. But full divided setups have many advantages too if youre willing to pay. and cool down loosing energy.And yes you are correct all these bad things fade away as more stronger pulses come at shorter intervals(higher rpm).Divided NEVER happened for top end. Its the big A/R imo that fuarks things on bigger divided turbos not the bigger wheel.Plus one man's big turbo is other man's small turbo :) its about the combination. But this discusion will never end. I think you're absolutely correct on all counts. It's nice that someone else understands that the use of the correct combination for many situations outweigh the hype and utility of exotic (or near-exotic) styled turbine housings with larger A/Rs. Unfortunately, the masses in many turbo circles are similar to an Enzyte advertisement; Their belief is "no matter what anyone tells you, size always matters." It really doesn't unless you're talking about a specific form of racing (mainly drag-racing in the U.S.), but many here like to think that it always does. Amen.Bigger is better #1 rule. The simple way is most of the times better but sometimes people want to differ too much. Do you have any clue is GSR cams break the static compression a little bit more from the stock b16 cams? Or i have to get the 300$ R cams to break that 10.8 - 11 compression i have? Changing a camshaft does not affect static but dynamic compression, what you probably mean. I made some calculations so you got clue how much cam swap affect. Just disclaimer, there's always variables like real exact static cr, camshaft timing events, lash adjustment and so on. Best way is measure everything, no assumings or calculators. But with 10.8:1 static CR and stock intake cam you are somewhere on +10:1 DCR, changing to "GSR" drop it to +9.9:1 and "Type-R" 9.7:1. Yeah i was speaking about dynamic.I just use a direct translation from greek ,haha, about lowering the static by breaking it with bigger duration cams. 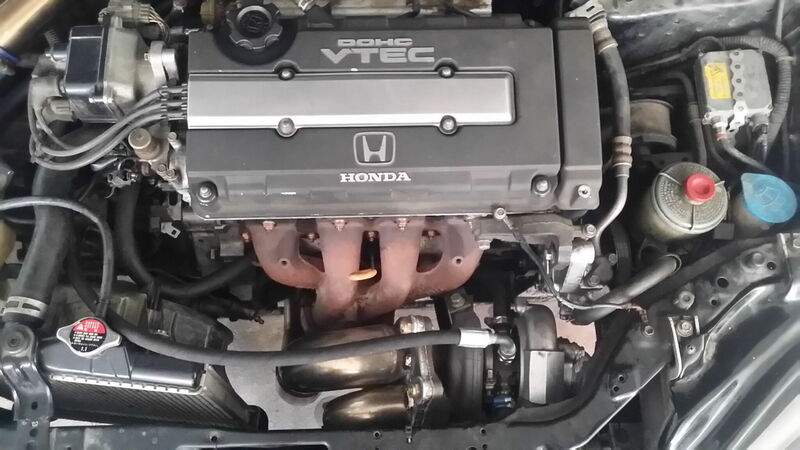 The thing i didnt understand tho is why you are refering only to the intake cam. 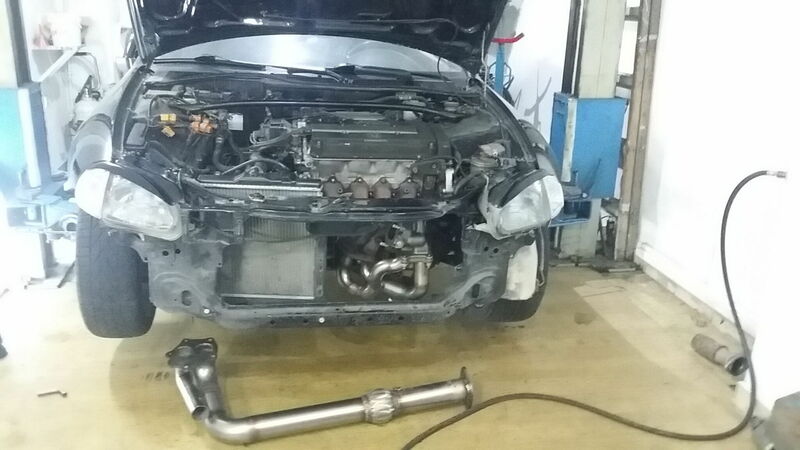 Maybe i make a combination of stock intake cam with GSR/ITR exhaust cam? The thing i didnt understand tho is why you are refering only to the intake cam. Because closing event of intake valve is what matter when calculating dynamic compression ratio. Of course, it is still just "static" calculated value which doesn't count volumetric efficiency which can instead increase (higher BMEP). Look i was thinking about sending some air out via overlap. Do you have any clu about overlap differences among b16/gsr/itr cams? They don't change your static compression. that's the quench pads of the GS-R vs. the B16 head. 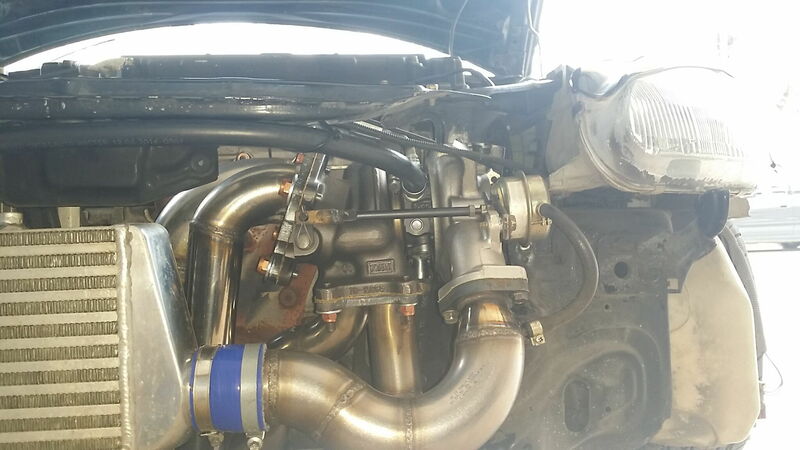 Glad to see someone do this...I had a setup like this in mind, especially since Evo turbos are very responsive.